The first time I saw The Maine, they were on tour with Danger Radio, The Cab, Metro Station and Forever The Sickest Kids. They all still had X’s on the back of their hands and their most popular song was their cover of Akon’s ‘I Wanna Love You.’ Since then, I’ve had the pleasure of seeing them six more times, and it’s been amazing to watch the transformation they’ve undergone. However, none of those performances seem to have captured The Maine in the same way that their performance on their documentary, An Acoustic Evening With The Maine has. “Strength will find you sooner than you ever thought it would” the lit up backdrop reads as the film switches from the black and white and sepia toned introduction to the live concert footage where it wastes no time in jumping into the first song. ‘I’m Sorry’ is the band’s opener, which makes it quite apparent that this set isn’t so much an acoustic one-- as it still finds Jared Monaco on his guitar, Garrett Nickelsen on his bass and Pat Kirch behind his drum set-- so much as a stripped back performance with reimagined versions of their songs. With Kennedy Brock on the acoustic guitar and John O’Callaghan on auxiliary percussion and occasionally the keyboard, it’s amazing to hear songs that were already amazing take on a new life. The first surprise of An Acoustic Evening With The Maine-- but certainly not the last-- comes in the form of the rearranged ‘My Heroine.’ A song that was originally a gritty rock song is transformed into four minutes of alt-country fit for a smokey dive bar. (And we mean that in the best way possible.) This remake, for lack of a better term, is just a glimpse of what this band still has up their sleeves to offer, and just a taste of what viewers have in store for them for the rest of the film. Just over an hour into the release is where fans will find the most acoustic moment of the performance as O’Callaghan sings ‘Take Me Dancing’ alone on stage with an acoustic guitar. It is also the highlight of the whole thing. While the Pioneer b-side isn’t much different from the recorded version, save for the lack of upbeat full band ending, it’s the atmosphere that will make viewers watch in awe. The silence of the crowd is haunting as O’Callaghan basically let’s his emotions bleed out on the stage. It’s the kind of moment everyone looks to find at a live performance, and few actually experience thanks to that one kid that just has to yell just how much they love the band. The finale shortly follows in the form of ‘One Pack Of Smokes,’ which is quite literally the perfect way to have ended the show. What makes live performances so special is their ephemerality. It may be the same band and the same set list, but no two performances will ever be identical. Once that performance is done, the moment is gone forever. But thank every holy being that they caught this performance on film. The song builds and then breaks just long enough for the band members to switch instruments. Brock takes over bass, Nickelsen grabs the guitar, Monaco gets behind the drums, Kirch toys with the tape recorder before hitting the toms and O’Callaghan plays the keyboard as the lights flash. It’s a goosebump inducing ending that will ensure at least one rewatch, that’s for sure. What’s most important about An Acoustic Evening With The Maine is that it feels so real and so The Maine that even though the performance isn’t even live, or even a full performance featuring the band jumping around in their typical manner, the passion that they put into their music is still palpable. In the end, anyone who has read our reviews for the Arizona quintet knows that we absolutely adore them, and An Acoustic Evening With The Maine shows exactly why. The way they are portrayed in this documentary is how they are in person. Having met the band both as a fan and an interviewer, this reviewer can personally attest to the sincerity that they aimed to convey through this documentary, which is what makes it such a treat. Whether you are a new fan, old fan, a fan that has seen them numerous times or a fan that has yet to catch them live, chances are you’ll love this release as much as we did. Not only is it a splendid performance from them, but it’s great insight into a band that may very well be the most genuine one in the business. 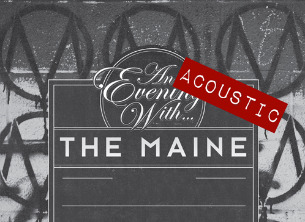 An Acoustic Evening With The Maine is available now via 8123.